In this Dec. 31, 2016 file photo, Justin Bieber performs poolside at Fontainebleau Miami Beach's New Years Eve Celebration in Miami Beach, Fla.
China's capital says it won't be inviting Justin Bieber to perform in the country because of his past "bad behavior," although it did concede that the Canadian singer has talent. In response to a question from a purported fan on its web page, the Beijing Municipal Bureau of Culture said it was acting in the interest of imposing standards and order and "cleaning up" the domestic performance market. It said Bieber's "bad behavior," including in his private life abroad and while in China to perform, had caused "public dissatisfaction." It did not provide details. Bieber performed in Beijing, Shanghai and the eastern city of Dalian in 2013. "Justin Bieber is a young foreign singer who is talented at singing but also controversial," the bureau said. "Therefore, it's not appropriate to bring in artists who show bad behavior," it said. "However, in the process of growing up and improving his words and deeds, he can truly develop into a singer who is beloved of the masses," it added. Bieber, 23, has had numerous run-ins with police around the world. During his 2013 visit to China he drew criticism when pictures showed him being carried up the Great Wall of China by a pair of bodyguards. 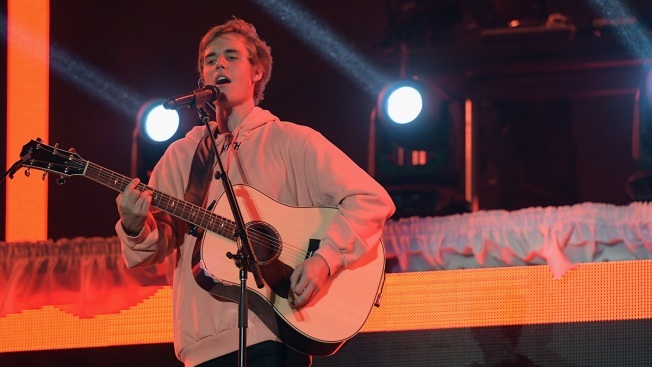 Bieber's "Purpose World Tour" wraps up in Asia in September with performances in Tokyo, the semiautonomous Chinese territory of Hong Kong, the Philippines, Singapore and Indonesia.